Part 1 of a 2 part article. Every person in business wants to increase sales, enhance product or service awareness, and improve their image. The trick, however, is to make your product or service out shine the noise of countless other advertisers competing for ad space, airtime, or web site. The following might help you in promoting your business. Take time to think about the benefits your product or service offers, Identify your customers’ needs, expectations, and how much they know about your product or service. Consider the effectiveness of past advertising efforts, for example, which ads brought you the most customers, what was it about previous ads that appealed to them, what modifications would you make to previous ads, and, the kicker, what wording, graphics, colors, and customer interpretations were most effective in promoting your business? The point is: You cannot force a sale through advertising without first considering customer needs. Your existing customers come to you or use your services because you offer something they need. It is as simple as that! Advertising is very good at giving your company name and brand recognition through associating your ability to meet customer needs. Your loyal customers may not be able to explain their positive feelings, but they know they like and use your products or services. Meet your customer’s needs and you will, in most cases, make a sale; However, It is not enough to just meet a specific need of your customer. To get a person to use your product or service, you need to demonstrate, some how, you can meet their needs. This can be with the right message, an appealing offer, or, in some cases, a simple color scheme. Whatever it is that moves your customers to select your business, you must be able to understand and appreciate the key customer needs you meet that cause your sales success. Once your customers’ needs are understood, DON’T OVER DO IT. Meeting customer needs is a very effective way to increase sales and grow your business because you have established credibility in your customers’ eyes. However, meeting customer needs is like predicting the weather . . . it is always changing. So, stay flexible and know you customers’ needs. At the same time, make sure you communicate your understanding of those needs as often as you can in as many ways as you can afford. 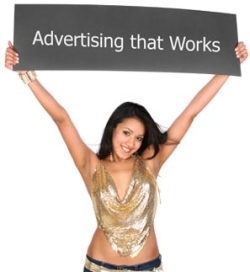 Advertising does work, just use it effectively.